DALLAS, – There’s no sign of a slowdown for the global travel industry, according to the latest Hotel Price Index™ (HPI™) from Hotels.com™. 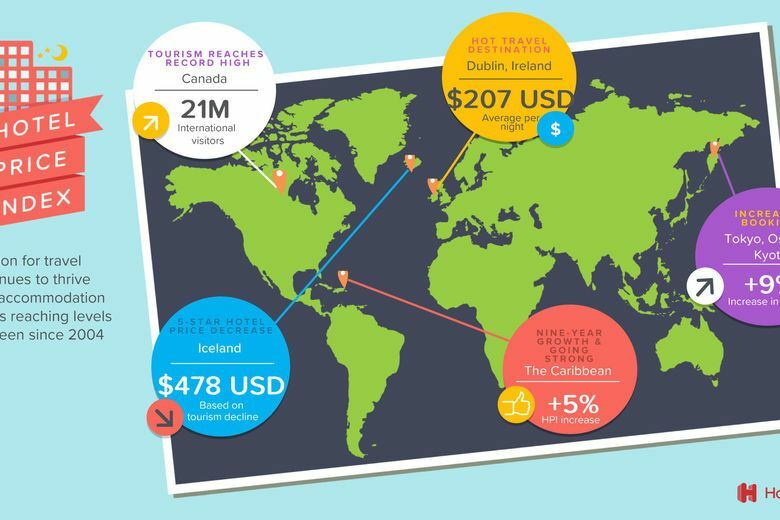 The prices travelers paid for overnight accommodation rose 3 percent globally in 2018, with every regional index, except the Pacific, receiving a boost. In Japan, Tokyo, Osaka and Kyoto, visitor numbers grew by almost 9 percent for a record high of almost 32 million. Osakaand Kyoto both rose more than 10 spots on the list of the U.S. and Canada’s most popular international destinations. Turkey’s tourism is booming despite a financially difficult year in 2018, with Istanbul jumping more than 10 spots in the top 50 most popular destinations for both the U.S. and Canada. International visitors went up by 22 percent in Turkeyand Istanbul recorded the highest rise in price paid by American travelers in 2018.
ᶧNote: Reward Nights are exclusive of taxes and fees. The value of the reward night corresponds to the average accommodation price of the 10 previously collected overnight stays. Registration and booking are available through the www.hotels.com website, as well as the Hotels.com app on the Apple Store and on Google Play. Secret Prices are available to Hotels.com app users, Hotels.com Rewards members, and individuals who unlock Secret Prices on the website by subscribing to Hotels.com by email. Secret Prices will be shown where the “Your Secret Price” banner is displayed on your search results. Available on selected hotels and selected dates only. Subject to full terms and conditions. Hotels.com is the most rewarding way to book a place to stay. We really love travel and we know you do too. That’s why we make it really easy to book with us. With hundreds of thousands of places to stay around the world and 90 local websites in 41 languages, Hotels.com has it all. So, whether you’re looking for value in Vegas, treehouses in Thailand or villas with views, it’s all just a click away. And with our “Reward-winning” loyalty program you earn free* nights while you sleep … what could be better? Booking just got smarter too. With over 25 million real guest reviews and an app so easy to use that it’s been downloaded 70 million times, you can be sure to find the perfect place for you.